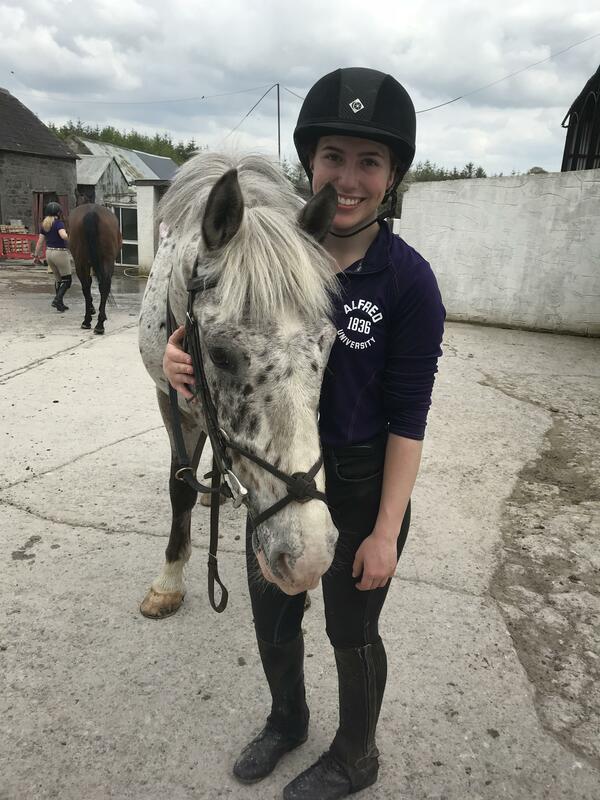 Haley goes abroad to experience horse life in Ireland! Haley and Speckles at Flower Hill. Photo by Gabbi Warren. This spring semester, I signed up for a course called the Equine Industry in Ireland, wherein we spent time learning about the role horses play in Irish life and economy. The class culminates in a short trip to Ireland to visit various equine-related venues and spend three days riding at Flower Hill Equestrian Centre, Cooper’s Hill Equine, and Dartfield Equestrian Centre & Horse Museum. I had a few days at home between Nationals and leaving for Ireland — enough time to move out of my on-campus apartment, unpack and re-pack what I wanted to take with me. In my experience, the best learning opportunities are those that combine fun with hands-on situations. My eleven-day stay in Ireland provided both, allowing me to broaden my horizons as a horsewoman as well as immerse myself in a culture separate from my own. I was surprised and impressed at the magnitude of the horse industry in Ireland’s economy as part of its agriculture department, at how much horses are woven into the fabric of Irish life. Driving through the Irish countryside segmented by stone fences, I saw more horses grazing in front yards than I saw dogs outside. This general familiarity with horses exists in stark contrast to Alfred—though rural, many of its school-year inhabitants arrive each fall never having seen or touched a horse. The opportunities a horse-rich society can provide were evident in our visits to the National Stud, Maynooth University, and Horse Sport Ireland. The National Stud offers internship each year, where the students work at the one of the best Thoroughbred breeding facilities in the world and gain experience that is valuable in any horse-related jobs later. Maynooth’s graduates were very employable despite their program having no hands-on horse component outside of a short internship, and I had a contact within my field lined up within minutes of telling marketing executive Michael Doherty my major and career goals at Horse Sport Ireland. However, despite the pervasiveness of the horse industry in Ireland, the disciplines it centered around were mostly limited to hunt seat and racing. At home, western events are my preference, but in Ireland the only western saddles I saw the whole time were old synthetic ones at the Dartfield museum. This absence made me wonder: could the Irish horse industry support and sustain a competitive western circuit, or does it limit itself by design to the tried-and-true, civilian-friendly areas of jump- and flat-racing? With a much older, more economically impactful, and stable horse industry as compared to that of America, would it be beneficial to implement a larger variety in disciplines, or would it only fragment the equine business there? In the U.S., where horses are used for everything from equine-assisted psychotherapy to pasture pets to high-level competitions in all disciplines, in most cases choosing an equine-related career goal is viewed as frivolous, as a hobby rather than a respectable, worthwhile job. In addition to studying the format of the equine industry, we visited some other popular tourist destinations: Inís Mor, the Cliffs of Moher and Birr Castle, in addition to having free days to explore Galway and Dublin. Even out of true horse country, the horses offering carriage rides in Dublin and on Inís Mor were a testament to the care of Irish horsemen and women — each one I saw was sound, well-behaved, and at a healthy weight, which is not true of some carriage horses I have seen in U.S. cities. I also noticed several colloquial differences associated with horse language. I heard the term “cowboy” used in description of an overbearing older man trying to solicit us to pay for a carriage ride on Inís Mor. Since I can’t help but be interested in language, I wish I had the chance to ask our bus driver what “cowboy” really means in Ireland, how the symbol born in the American West warped into something else as it traveled through hundreds of years and across an ocean. On the days we rode, the horses told me that our standard “whoa” has no meaning to them. Irish horses are creatures of silent body language, forgiving mouths, and hard hooves that plod along as steadily with one shoe as they do with all four over rocky soil. Seeing Ireland from horseback felt like the most authentic way to experience it. Chasing hounds across a field, following Oliver Walsh and his bugle, made me feel like an Irish huntswoman. What’s a boat tour of Galway Bay compared to galloping through the surf, tasting its salt, wringing it out of your half chaps the next day? How can reading about the crisp rains of early summer live up to riding in a downpour, laughing at the squelching noises your soaked breeches make against the saddle? My favorite pictures from the trip are framed by the ears of Irish-born ponies, and those days above all else will stand out in my memory.